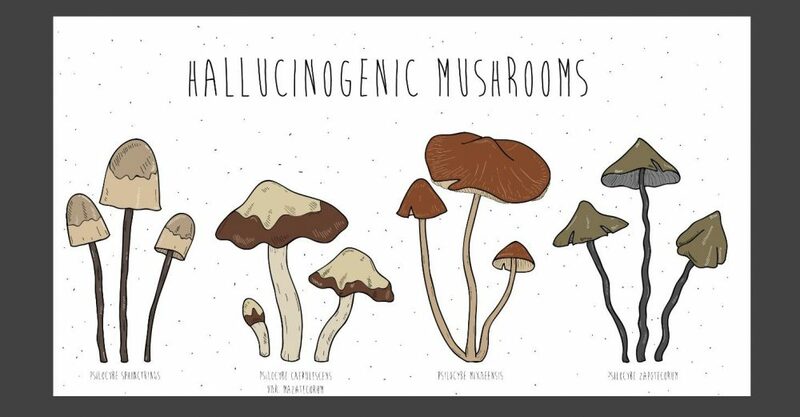 I am no mushroom expert so I thought I’d start the topic off with some pretty and accurate(ish) images of psilocybin mushrooms. Fortunately for newbies like myself, the net is full of experts who can speak to the spiritual, archeological, ethnobotanical and recreational aspects of this special fungus. Here a few of the sites I’ve used to get up-to-speed on the basics – and then some. Wikipedia – Psilocybin – this site has a surprising amount of content on this compound, though some of the research content looks a bit dated. Wikipedia page for psilocybin mushrooms. PsychonautWiki – a LOT of information on a LOT of psychoactive substances, natural and synthetic. MAPS – Multidisciplinary Association for Psychedelic Studies – a rich resource of new research on a variety of psychedelics; this link to their ‘psilocybin’ search results delivers about 100 studies, articles, interviews, and newsletters. The Third Wave – a website run by a group supporting informed discourse and advocating for integration of psychedelics back into the culture. They’ve pulled together a lot of basic and referenced material on all the usual psychedelics – LSD, DMT, ibogain, the lot. They’re big into microdosing and offer a number of guides on this and general usage. Erowid – a member-supported organization that offers a straight-forward database of information about psychoactive plants and chemicals; over 360 herbs, plants, chemicals and pharmaceuticals. And a toad. This link to their psilocybin mushroom page is a great technical resource.